Like salmon who swim upstream, go against the grain of that same turkey bacon & try a different protein for breakfast. I always keep some in my freezer. Keep it simple. Smoked salmon is a great ingredient loaded with protein & muscle building amino acids. Caper, cream cheese & salmon is a classic combination & works well together. Slice croissant down the middle. Toast each side. 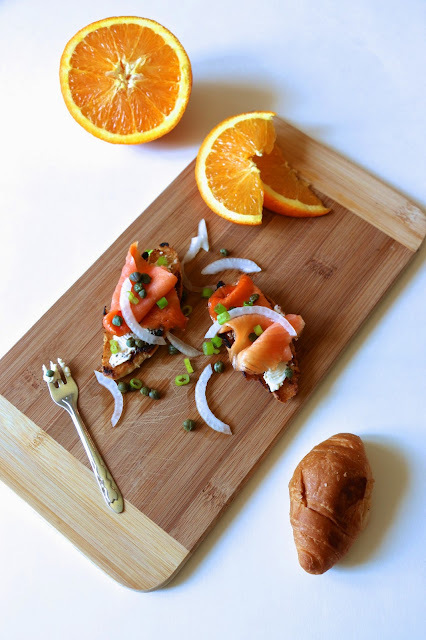 Spread cream cheese on bread & top with smoked salmon, onions & capers. Sprinkle with scallions, dried chives, salt & black pepper. Tip: If you are on a car-conscious diet, the croissant can be replaced with Ezekiel toast or whole wheat English muffin.